Pick the perfect color scheme to paint unfinished wood birdhouses and follow this painting tutorial from C&T Publishing. Bring bright colors to your garden or give as a gift. Choose color scheme with the Paper Crafter’s Color Companion. 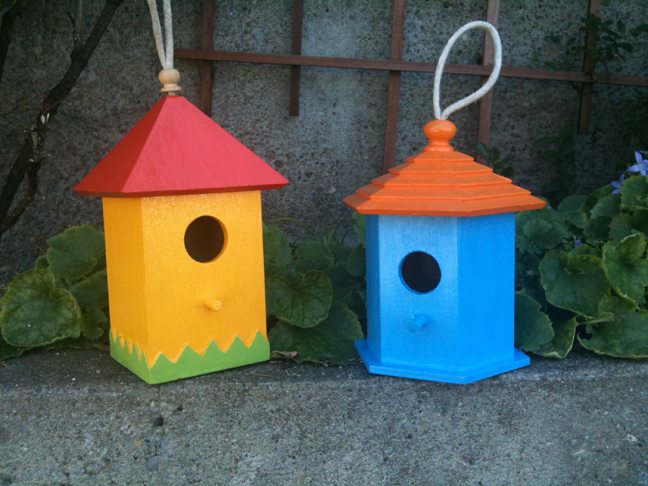 Sand all surfaces and edges of birdhouse with 300 grit sand paper until smooth. Dust off with a cloth. Mix paint to achieve desired colors. Paint surfaces of birdhouse, one color at a time, and leave out to dry on Freezer Paper Sheets (so the paint doesn’t stick to anything). Once dry, sand painted surfaces with 1500 grit sand sand paper. add an additional coat of paint, and once dry, sand until smooth with 1500 grit sand paper. Apply first coat of PLAID Outdoor Gloss Sealer and let dry for 30 minutes. Apply final coat of gloss sealer and wait a few hours for it to dry completely. This isn't a project for building a birdhouse, it's for decorating one that you can hang inside as a decorative accent or place out side to be used by real birds. I like hanging them on my pato where I can watch the birds, but I also like them inside. I have one over my kitchen sink.